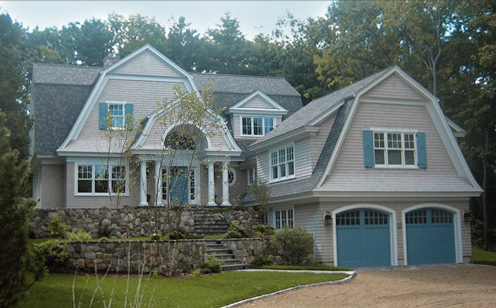 After extensive blasting of ledge on this tear-down/rebuild, we set this gambrel shingle style house further back on the lot for more privacy. The cathedral ceiling in the foyer opens views to a custom oak stairwell. The kitchen, living, and dining room have an open floor plan with custom built decorative beams. The three-season porch overlooks a waterfall that descends into a landscaped pool.